I was recently asked to illustrate the story of a woodcutter and his wife who are granted three wishes. When given a bowl of beetroot soup he mistakenly wishes he could just eat something nice like a sausage for once. 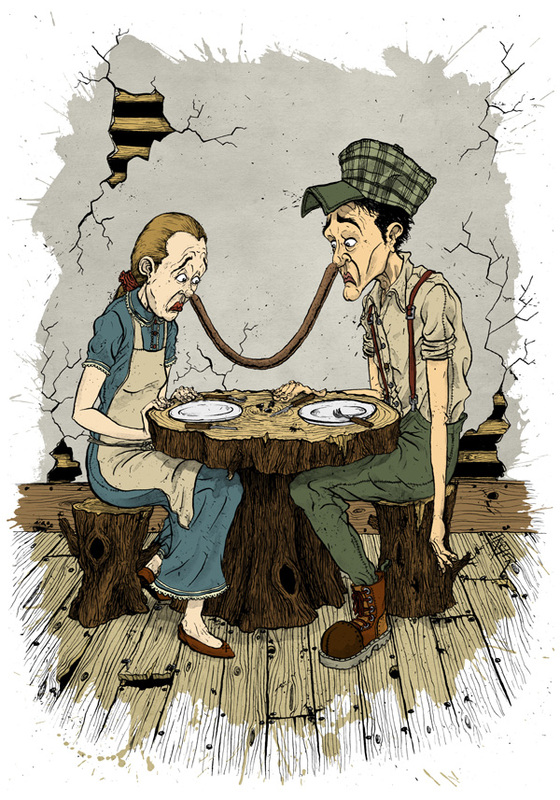 Upon the appearance of the sausage on his plate his wife exclaims that she wishes the sausage would hang from his nose, a feeling immediately thrown back by the woodcutter and hence we end up with the sorry state of affairs that I have drawn up. The story appears in “The Seed & Other Fairy Tales” by Joseph Hillenbrand which is available for your Kindle now from Amazon.